Thank you for your interest in Skin Temperature Probes. Please complete and submit the form below and an ADInstruments representative will aim to get in touch within one working day. If you’d like to speak to someone immediately, office contact information is available from the contact page. Suitable for connection to the Thermistor Pod. Suitable for connection to Bridge Amps and the GP Amp (discontinued). Skin Temperature Probes are specifically designed for continuous temperature monitoring using the skin as an indicator of body temperature. Skin Temperature Probes are specifically designed for continuous temperature monitoring using the skin as an indicator of body temperature. They have a lead length of 2 meters and are designed to operate over the range 0 - 50°C, they are well suited to applications such as biomedical temperature monitoring requiring repeatability, high sensitivity and rapid response. 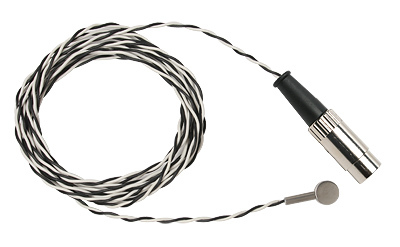 Suitable for connection to a Thermistor Pod and also available with an 8-pin DIN connector, which is suitable for connection to Bridge Amps and the GP Amp (discontinued). The Skin Temperature Probes are supplied with a 90 day warranty as per ADInstruments standard warranty terms.